“That didn’t really happen, did it Grandpa?” asks his granddaughter. She has been sitting upon his knee the whole time that he told his story. He brings her in close to give her a hug and grace her with a kiss upon her forehead. It’s moments like these. The precious time spent with his grandchildren that make life worth living. Not all the Gold records and music awards, can ever give him the blessedness that he receives from any one of his grandchildren. Satisfied with her story, she hops off his knee to go play with her dolls. With love in his heart, he realizes that this little girl may never remember the stories he has told her. As he watches his granddaughter, his mind brings him back to the memories of others sharing stories with him. Oh, how he wishes he could go back and write those stories down so he can revisit them. Life is a collection of stories and so many of those tales are lost in the void known as time. 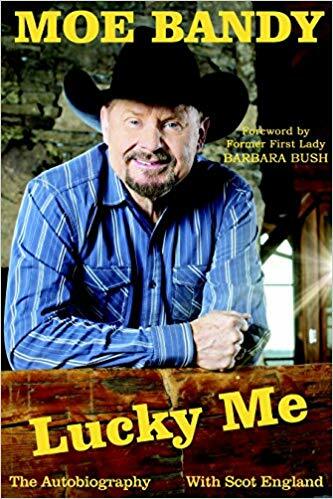 In 2017, legendary Country Music entertainer Moe Bandy teamed up with writer Scot England to compose his autobiography called Lucky Me. Born in Mississippi and raised in Texas, Moe began as a bronco busting and bull rider at the age of sixteen. His father was an avid musician who played in a band called the Mission City Playboys and taught Moe how to play the guitar. In 1962, he became tired with all the bruises and broken bones that came with the rodeo life and he began seeking a career in music. During the day, he worked as a sheet metal worker with his father and at night, he spent performing at local venues. In 1973, Moe moved to Nashville where he recorded his first song called “I Just Started Hatin’ Cheatin’ Songs Today.” However, it wasn’t until 1975, when he recorded his signature song “Bandy The Rodeo Clown,” that he gained national attention. Moe Bandy went on to record and release over twenty-four albums including his latest called Lucky Me. Throughout his fifty plus year career, he has entertained us with songs like “Hank Williams, You Wrote My Life,” “It’s a Cheating Situation,” “Someday Soon,” “Till I’m Too Old To Die Young,” “Brotherly Love,” “This Night Won’t Last Forever,” and his ever popular patriotic song “Americana.” Through it all, he has maintained his down home traditional country style. Moe gives readers a first hand account of his career while sharing with them the behind the scenes story of his life. The book opens with a foreword by First Lady Barbara Bush. Later in the book, Moe shares with the readers his introduction to and friendship with Barbara and President George H.W. Bush and their family. This friendship allowed Mr. Bandy to perform in the White House as well as visit with the Presidential family at Camp David. What makes Moe’s stories about the President so attractive is the fact that he told them with no political agenda attached. Nonetheless, what makes this entire book so compelling is the fact that Moe invited his family, friends and band members to share their own stories about him. Moe shares with the readers his time spent touring with Joe Stampley as well as working with other such notable entertainers. He also shares stories about new entertainers who opened for him, like George Strait and Reba McEntire. You haven’t made it as an entertainer in country music, unless you have performed on the historic Grand Ole Opry. Moe shares his story of how Legendary Opry Member, George Morgan, introduced him on stage. Although majority of the autobiography is quite light and entertaining, Moe does share with the readers some of the low points in his life. Like many entertainers, Moe dealt with alcoholism and shares with us on how he over came his problem. Nonetheless, the authenticity of the man comes out as he writes about the night he came close to taking his own life. “Well...there is hope for anybody. You can get through that stuff and of course I couldn’t have got through any of it without the good Lord. That was just the strength that I went too and just helped me so much. People say ‘I’ll be a drunk for the rest of my life’ or this and that; but you can change. You can turn it around.” humbly shares Moe. Moe Bandy continues to perform and tour today. He is currently in the studio recording new songs for an up coming album. He states that the album will be released later in 2018 or early 2019. With the help from Scot England, Moe opens the doors to his life in this well written autobiography. On these pages, he takes us on the journey from his humble beginnings as a child to his rodeo days and through his career as a country music entertainer. As you read this book, you will laugh and you will wonder, as this is just a glimpse into this multi talented and humble man.